When sailors yell out "prepare to jibe" at this year's SAP 505 World Championships, they should be more prepared than they ever have been before. That's because this year, sailors are using SAP BusinessObjects technology to better do what they've always done with physical charts, weather forecasts and instincts – plot the best strategy to victory. 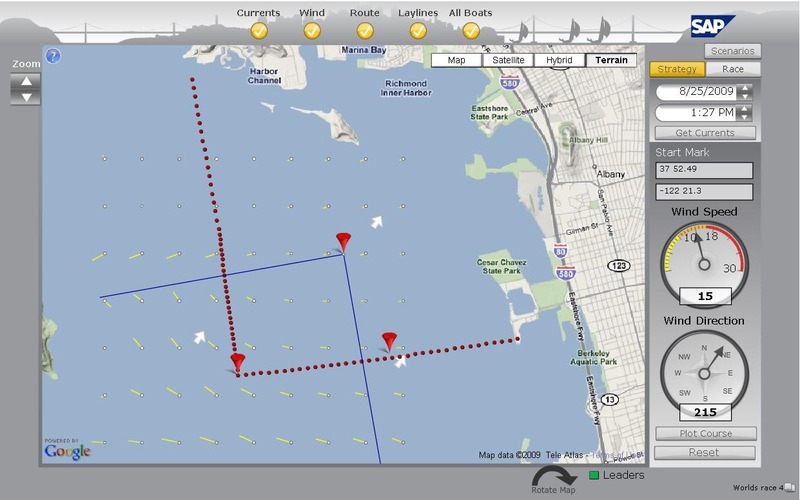 At the urging of SAP executive John Schwarz, himself a sailor, SAP designed an Xcelsius dashboard for the 54-year-old sailboat race which it says is helping sailors better plot their routes by taking into account detailed data on wind speed and currents. "There are things we already know," said Kimball Livingston, a longtime sailor, author and editor-at-large of Sail Magazine. "But with the technology and the analysis, we're seeing it graphically represented in a way the sailors are finding fascinating." BI adoption continues to grow despite the recession, according to a recent Forrester Research report. And SAP's sailing dashboard demonstrates the vendor's push toward something it's vowed to do with the SAP BusinessObjects toolset – make business intelligence and analytics software more pervasive within companies. It's something SAP emphasized with the launch of SAP BusinessObjects Explorer at Sapphire back in May. Dubbing it a "Google-like" BI search tool, the product brings together search and navigation capabilities from SAP BusinessObjects with the SAP NetWeaver Business Warehouse Accelerator to help customers mine large data sets in a matter of seconds. "There's no BI skill required whatsoever," said Franz Aman, SAP's vice president of intelligence platform product marketing, of the sailors using Xcelsius. In races like the America's Cup, it's common for huge amounts of data to be analyzed for fine points, Livingston said. But in a bare-bones race like a 505, technology has never been used to this extent. A total of 100 boats compete over two weeks on a 10-mile course in the challenging waters of San Francisco Bay, sometimes racing twice a day. The boats, 16 by 4 foot dinghies, are manned by two sailors. The sails are more than twice as large as the boat itself. 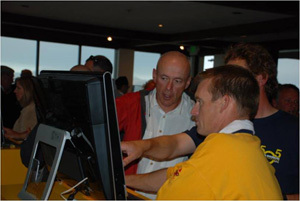 SAP put the Xcelsius software on three monitors in the yacht club and said teams are getting there as early as 7 a.m. and staying until 11 p.m. to do their research. The dashboards rely on data from a company called Local Knowledge, which gathers details on the currents and the wind, to generate models of the best possible route for the conditions. All of this is overlaid on a Google map of San Francisco Bay. Meanwhile, as the race is going on, SAP systems back in Germany gather data on the latitude, longitude, speed, direction and total distance the boats have traveled via GPS devices on the boats that are smaller than a cell phone. At the end of the race, sailors can compare these metrics against their place. Sailors can also save their research on the route they chose and compare it with any changes they had to make in that route during the actual race, in order to evaluate their results and plan an approach for the next day. The technology is benefiting sailors in the middle of the pack the most, Livingston said. "They're looking at how the data comes out and observing new ways they can approach their racing here," he said. "It becomes very vivid to someone what's going on in terms of the currents and the positions in relation to other boats."